Just one day after Arnold Schwarzenegger revealed that he'll start shooting the new Terminator reboot next March, producer James Cameron has offered an intriguing update. 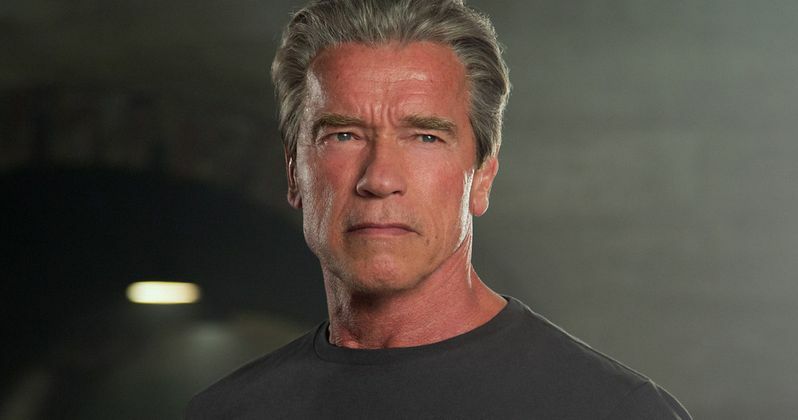 While promoting the upcoming 3D release of his 1991 classic Terminator 2: Judgment Day, James Cameron teased that Arnold Schwarzenegger will be playing a human character, whose DNA served as the basis for the T-800 Terminator models. Here's what the filmmaker had to say below. "You got to ask yourself, 'Why did they make these characters look and sound like Arnold? There has to be a reason. So yeah, it has flashed through my mind that there has to have been a prototype. There has to have been a guy who's DNA was harvested from, that they grew the organic outer layer that they grew the Terminator from...and that presumably was a real person at some point. Now, the question is, did that person have some sort of meaning to Skynet on WHY they chose that one (Arnold)? Or was it like a whole rack of Terminators and the one that happened to be the Arnold model just happened to be closest to the door going out to the time displacement center and all the others looked different? I've asked myself these questions but it's never been resolved...so stay tuned! We're talking pretty seriously now about doing some new Terminator films or possibly a trilogy and you'll just have to see what surfaces in those." This statement comes through a Q&A with The Arnold Fans, although it seems the director is unaware that this type of sequence has already been attempted before. There was a scene in 2003's Terminator 3: Rise of the Machines, which James Cameron was not involved with and was directed by Jonathan Mostow, although it wasn't included in the theatrical cut of the film. The scene in question, which you can watch below, showcases all of the technological achievements of this new company CRS, which obtained all of the patents from Cyberdyne Systems, to create these Terminator robots, who were all based on a man named Chief Master Sergeant William Candy (Arnold Schwarzenegger), who has an atrocious Texas accent. Still, even if James Cameron is aware of this Sergeant Candy scene, that may in fact be the inspiration to get this right, since the scene is quite cringe-worthy. James Cameron also teased last month that he's planning on producing an all new Terminator trilogy, adding that he's in discussions with David Ellison of Skydance Productions, who currently holds the worldwide rights to the Terminator franchise, with the U.S. rights reverting back to James Cameron in 2019, 35 years after his first Terminator movie. James Cameron revealed last month that he's "leaning towards" a new trilogy that will reinvent the entire franchise. Tim Miller (Deadpool) is directing this new Terminator movie, although it isn't ultimately clear if he worked on the script, or who was brought on to write this Terminator Reboot. If production does in fact get started next March, that could put this new movie on track to hit theaters in 2019, just as the U.S. domestic rights to the film revert back to James Cameron. While we wait for more details on the Terminator reboot, take a look at the bizarre Sergeant Candy scene from Terminator 3: Rise of the Machines below.